The idolization of entrepreneurs contrasts with the lack of support for entrepreneurship within companies themselves, despite its great transformation potential. Start-up culture has now taken such a hold that 62% of millennials want to be entrepreneurs. It seems almost everyone wants to start a business and be their own boss, but the reality is that in 90% of cases such projects are doomed to failure. 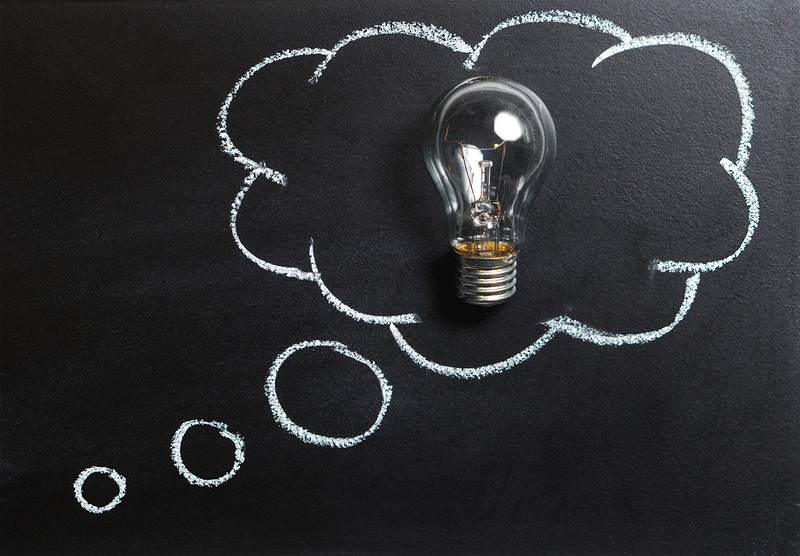 However, as we saw in the IESE and Michael Page’s Business Talks 2918, there is another way of doing business that can be just as stimulating and offer a greater likelihood of success: intrapreneurship. Intrapreneurship is significantly less common in Europe than in the US, where it is more well-known and appreciated. We tend to establish a firm distinction between company managers and entrepreneurs, as if they were two totally different profiles. However, the fact is that most entrepreneurs worked for other companies before embarking on the adventure of creating their own business. But what if they had been given the option to become entrepreneurs without leaving the company they were working for? 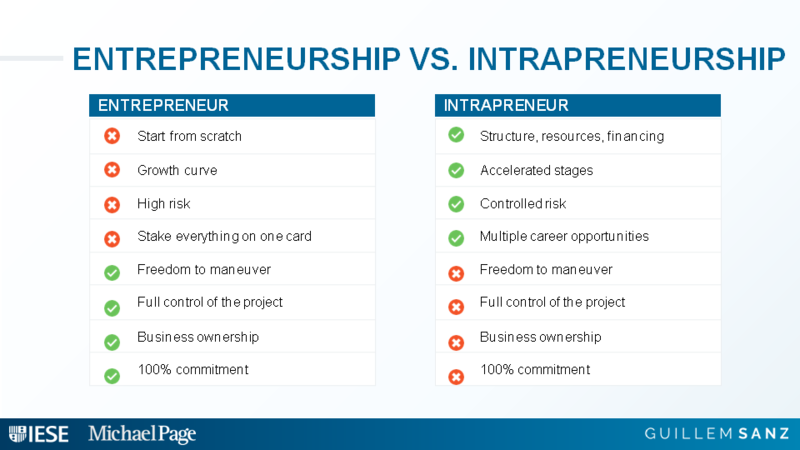 Although there are some clear differences between entrepreneurs and intrapreneurs, professionals can nevertheless take on either of these roles, e.g. at different points in their professional career. We live in a very competitive ecosystem in which companies need to constantly reinvent themselves. When everything changes around you, simply keep doing things in the same way usually leads to failure, no matter how big or consolidated the business may be (you only need to see what is happening in retail giants such as El Corte Inglés). However, overcoming resistance to change in a business organization is not easy, especially when results are still positive and there is no pressing need to innovate. I saw this, for example, when I was Logistics Director at Caprabo and headed up the outsourcing of their e-commerce logistics in order to remove the bottlenecks that built up at each supermarket when preparing the online orders, which at the time were picked in store. It turned out to be a successful strategy which was later copied by other food retailers, although at the time it clashed with internal inertia. Launch a new business unit, subsidiary or start-up that operates independently, but under the umbrella of the business group. Buy a start-up or emerging business and integrate it in the business group, striving not to constrain its scope for initiative. Take part in an intrapreneurship ecosystem, in collaboration with business partners, strategic suppliers, customers, etc. There is a fourth alternative, which is to try to transform a conventional company into a start-up-minded organization. However, significant internal resistance and inertia usually make this very difficult. In this regard, smaller, new organizations tend to be more agile and adaptable, while larger organizations are more resilient and stable. Set up channels to ensure innovation proposals can flow between the company’s middle and low levels and senior management. Draw up rules, so the intrapreneur has a clear understanding of his or her resources, autonomy and freedom to maneuver. Create specific teams for the project, counting on in-house and external professionals who complement each other’s skills. Avoid any internal perception that the intrapreneur or his or her team enjoy special privileges, and make sure they act responsibly. Offer attractive remuneration tied to results, which may include giving intrapreneurs shares. Sign an exit agreement specifying how to proceed and different responsibilities should a project not turn out as expected. And finally, the most important thing: intrapreneurship must be believed in. It makes no sense to play at being innovative at the start of the year when financial resources are available, and then undermine the project a few months later when it is time to balance the books or the risks involved begin to cause vertigo. The trend today is to place entrepreneurs on a pedestal, with businesses, professionals and institutions applauding and rewarding those people who take on risks outside of the company; however, being an entrepreneur within the company is still not well regarded. Now is the time to change this mindset by believing in intrapreneurs!